The map below shows the surface percentage covered by tree canopy (based on data by the USGS from 2010). Simply put, green areas represent forests, and white areas represent other types of land cover, such as crops, grass, buildings, bare rocks, etc. I have also made detailed maps of Western Alps, Eastern Alps, and the Pyrenees, which show their tree cover together with a very fine shaded relief. There are a few important features to notice. Virtually all mountain ranges are forested (except the mountaintops at high altitudes), whereas lowlands tend to be covered with erratically distributed small patches of forest. This is the result of several thousand years of deforestation, which peaked in the 19th century, followed by rapid reforestation in the 20th century, especially in France, Spain and North European countries. 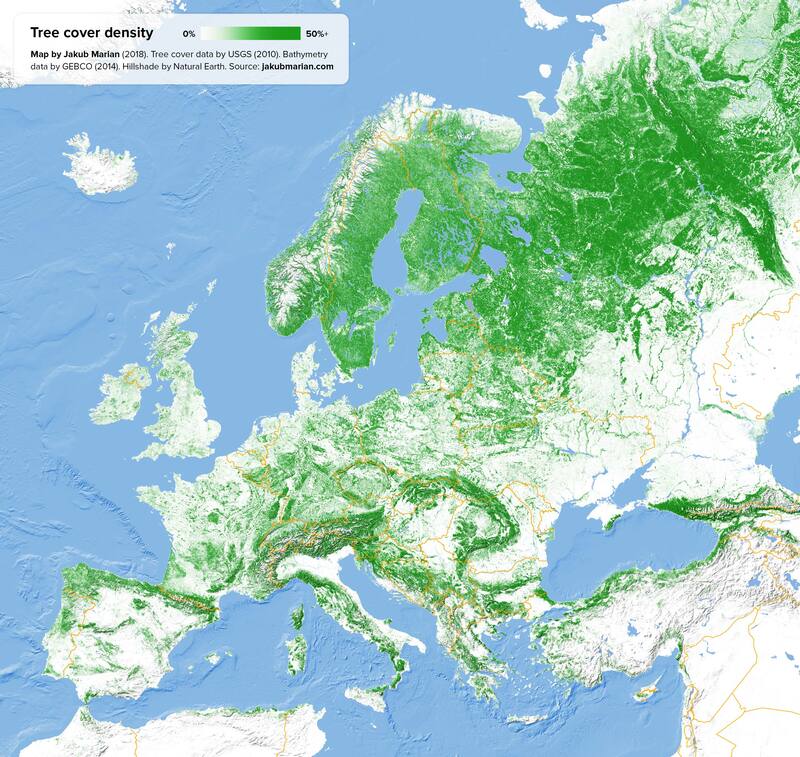 Another feature to notice is the continuous tree cover of Sweden, Finland, and the north of Russia. This is the so called Scandinavian and Russian taiga, one of the largest forests in the world.